Many of the features observed in the Buntsandstein quartzite cobbles can be explained by spallation. In fracture mechanics, spallation is a well-known process typically combining compressive and tensile stress (not to be confused with nuclear spallation). Spallation occurs when a dynamic compressive pulse impinges on a free surface, where it is reflected as a rarefaction pulse. 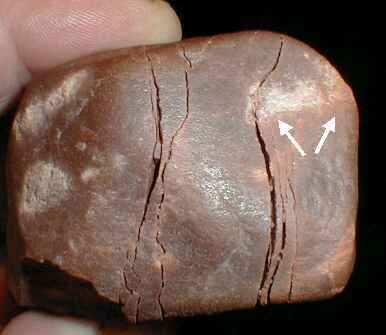 The associated tensile stress may lead to internal spallation fractures and to complete spalls detaching from the free surface. The image below shows strong spallation fracturing in an experimentally shock-loaded Armco iron. Fig. 1. Spallation fractures in experimentally shocked ARMCO iron. Photographs by courtesy of Michael Hiltl. Fig. 2. Impact spallation fracture in an amphibolite cobble from the Lake Tüttensee crater, Chiemgau impact event, Germany. 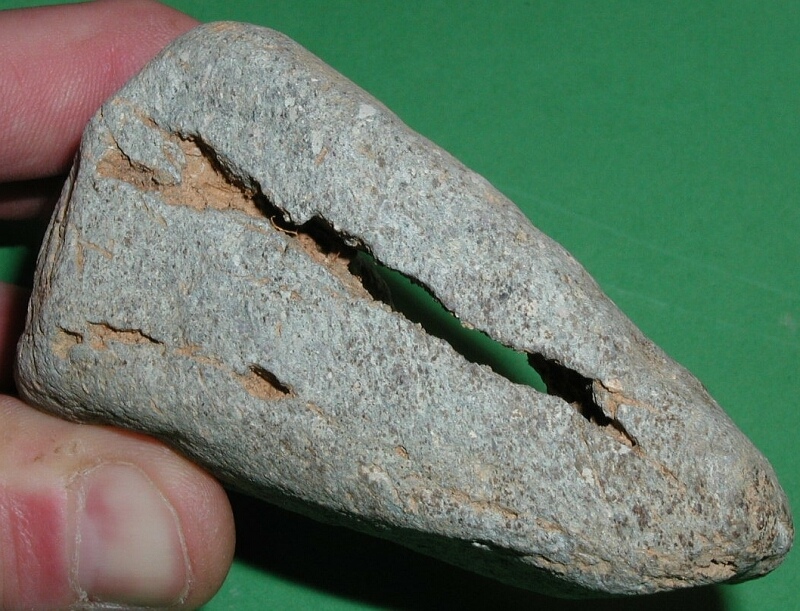 The similarity to the experimental spallation fractures in the ARMCO iron specimens (Fig. 1) is unmissable. In impact cratering, spallation is well known to occur in the near-surface zone of the target (Melosh 1989), has been described for lunar micrometeorite craters (Hörz et al. 1971), and has been studied in the laboratory by experimental impacts in, e.g., gabbro targets (Lange et al. 1984, Polanskey & Ahrens 1990). A remarkable inventory of impact spallation has been established in shocked cobbles from the Chiemgau meteorite impact crater strewn field in Southeastern Germany (Fig. 2; also see a respective article). Also in the Ries crater impact spallation is a well observed feature in the ejecta rocks (see below and HERE). 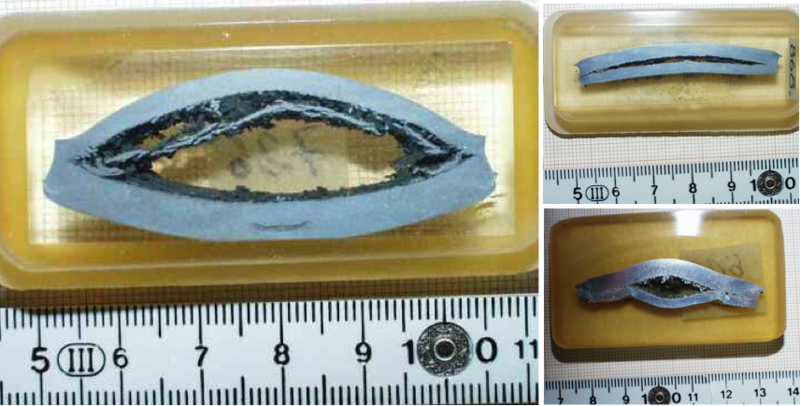 Many fractures in the deformed Buntsandstein cobbles have much in common with the spallation fractures experimentally produced in shock experiments, as is shown in the images below. Here we add that the formation of the typical spallation craters complying with the same physical processes has already been addressed in the chapter on the Surface features. Fig. 3. Sets of closely spaced open spallation fractures in a quartzite cobble which, otherwise, is macroscopically untouched. A tectonic origin can be excluded. Note that the master fracture at the right mirrors the cobble surface (arrows). For geometrical reasons, this is expected as a result from the reflection of a dynamic pulse at the free surface. In the case of the Buntsandstein cobbles, there was not a free surface in the strict sense but a distinct contrast of shock-wave impedance between the very dense quartzite cobbles and the sandy, porous matrix. Fig. 4. 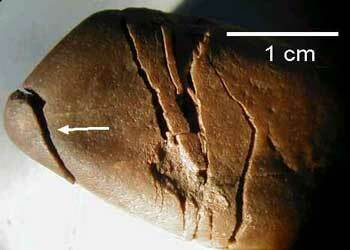 Small-spaced spallation fractures in a quartzite pebble. 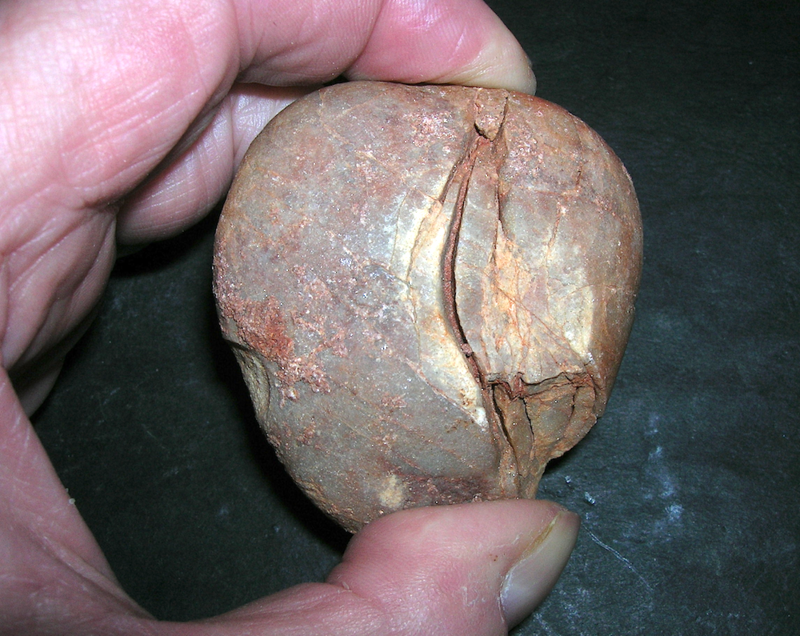 Note the lens-shaped spall nearly completely detached from the pebble! Fig. 5. Widely open spallation fissure from a tensile pulse that moved as a reflected compressive shock pulse from the right-hand cobble surface. Forefinger and thumb are roughly marking the axis of mirror symmetry. Fig. 6. Impact shock spallation. 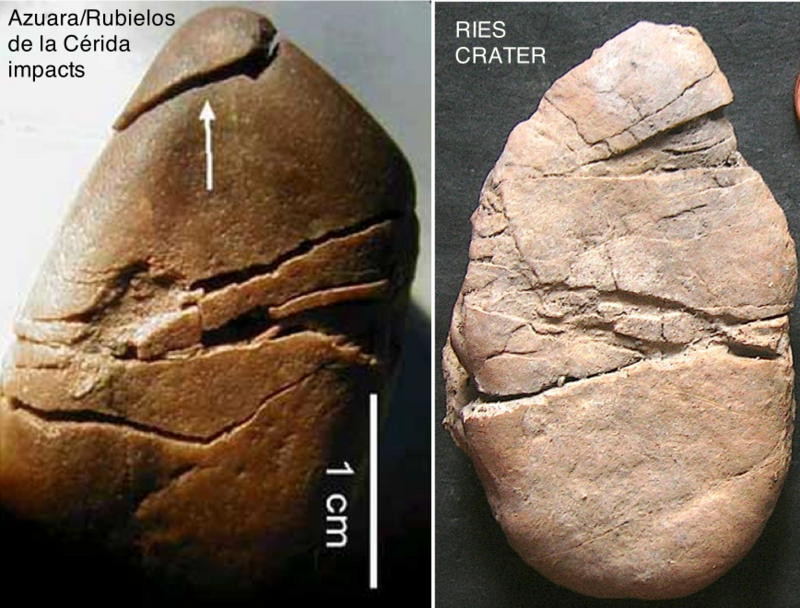 Comparison of a Ries crater deformed geode from the ejecta blanket with a deformed quartzite cobble from the Spanish Buntsandstein: The similarity is striking. The deformed quartzite cobble already shown in Fig. 4 is a typical example of shock spallation that may lead to strong dynamic tensile fracturing. Fig. 7. 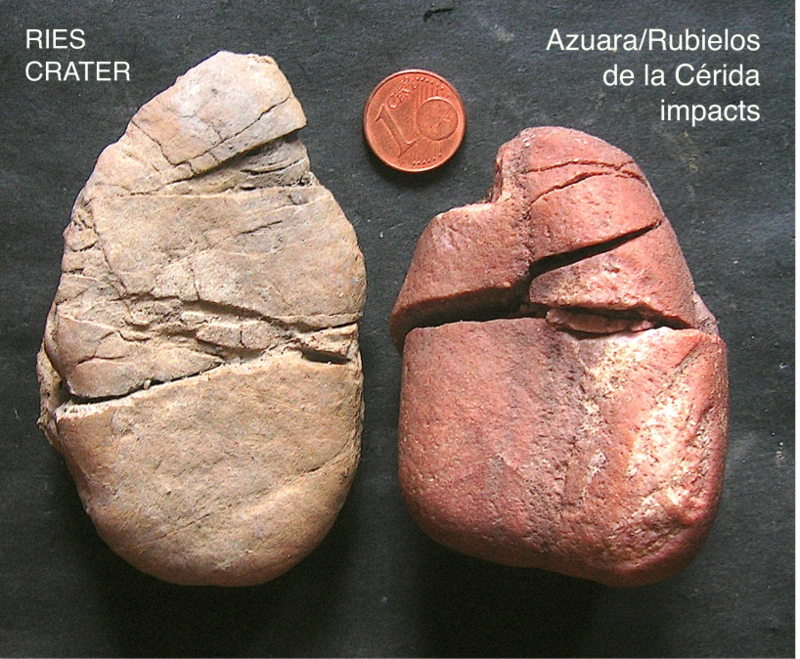 Practically identical breakdown of Ries crater Azuara/Rubielos de la Cérida cobbles suggesting the same process, impact shock spallation, of formation. Any tectonic long-lasting stress can be excluded. Fig. 6. Spallation occurs also on a microscopic scale. 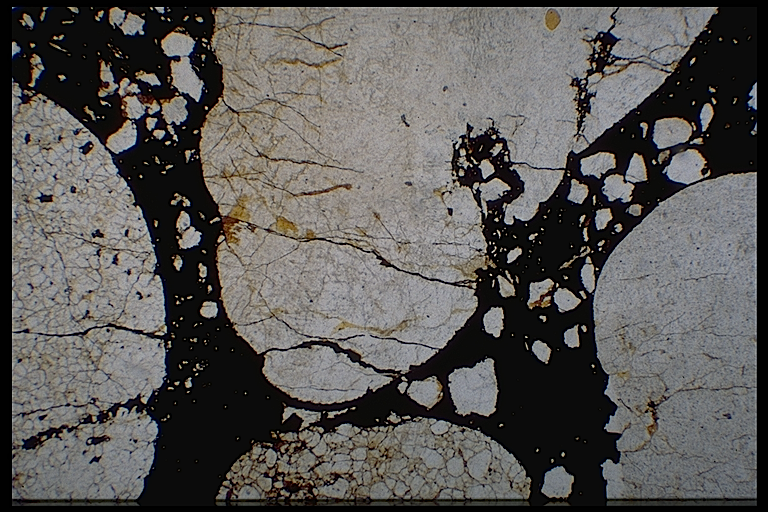 In the photomicrograph (plane light), a spall is completely (2-D) detached from a quarzite grain in the Buntsandstein conglomerate. The image shows pure tension without contact between the neighboring grains (in 2-D). The matrix is opaque from iron-hydroxide. The field is 9 mm wide.